Since this blog is US-based, the UK is across the pond for us. This past summer, I read two enjoyable chick lit novels written by British authors. Also, oddly enough, I could see Rebel Wilson playing the lead character if either book were made into a movie. 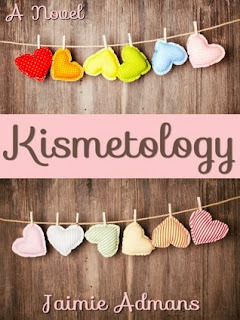 Kismetology was a cute novel with a clever concept. Usually the mothers are the ones trying to set up their children on dates, but this time the tables are turned. I found myself laughing out loud at Eleanor's quirkiness and all the crazy guys Mac meets in her attempts to find her the right match. The story was interesting and I wanted to see what would happen, as there was a lot of build-up throughout. I like what Mac learned about herself along the way, as well. The only things that didn't work as well for me was some of the dialogue and Eleanor's age. There were times Mac would either argue with Eleanor or Dan (her boyfriend) and the dialogue would go in an endless loop for several pages. I also was thrown off when I found out Eleanor was just about 50. She seemed too quirky and set in her ways to be that young and also be the mother of an adult only 20 years her junior. I was expecting her to be closer to 70. Overall, Kismetology was a light and entertaining read. Enter Hollywood film star Nicholas Kaden, whose entourage is stirring up the village of Kassiopi while filming his new movie. He’s hot, he’s unexpectedly different, but is he for real? A while back, I read Knowing Me, Knowing You and was very impressed with Mandy's writing style. Then I read another book of hers that wasn't my cup of tea (but I heard others liked that one). However, I decided to give her writing another chance and I'm so glad I did. Excess All Areas is on the same impressiveness level as KMKY, if not better! It was cute and funny throughout. I loved Freya's candor and the way she didn't put up with people who tried to push her around. The armchair adventure aspect was also a treat, as I have never been to Greece. I still felt like I could picture it as though I'd been there 100 times, through Mandy's great use of description. The only thing that didn't work so well was Freya overreacting to Russell's humiliation in the beginning. I felt she should have just confronted him and still run off afterward. It wasn't like he thought he was doing something wrong on purpose at the time. Excess All Areas is a delightful read, especially when you are in the mood to be swept away on a vacation with a side of romance. I just found out that Public Property is the sequel, so I definitely look forward to reading that too! Thank you so much for that wonderful review! I love all the actors you've picked for the film especially Rebel Wilson! Great choices!